A month before he was to become Westinghouse chairman, Robert Kirby noticed something strange. Prices for uranium, the fuel that powered the nuclear plants Westinghouse was building, were soaring. Normally in the $5- to $6-a-pound range, uranium had more than doubled in price and was climbing fast. "I'm sitting here, and I wonder, 'What's going on?'" Kirby says. After all, uranium is found just about anywhere someone with a shovel can dig. "It wasn't yet a problem. It was a 'situation.'" It wasn't long before it was a situation out of control. By mid-1975, uranium prices surpassed $40 a pound. Westinghouse had little choice but to renege on agreements to supply the nuclear fuel to its utility customers. There was no way it could afford to do otherwise. Its 27 utility customers didn't care. They sued. It's not hard to understand how Westinghouse got into this fix. To win nuclear plant orders, it had agreed not only to build and service plants, but also to provide fuel. There was reasonable wiggle room for price escalation. But nothing was reasonable about uranium in 1975. With agreements to provide 65 million pounds over the next 20 years, and with uranium running more than $30 a pound higher than its contracts with the utilities anticipated, Westinghouse confronted potential liabilities of more than $2 billion. Stress spread like wildfire throughout the corporation, sinking morale -- and Westinghouse's stock price. Already a chain-smoker, Kirby started lighting up even more as he tackled the uranium problem. His doctor told him not to bother trying to quit. For the next five years, Kirby would be consumed by the crisis, leaving the rest of his senior executives to jockey for position behind him. It was a period when allies and enemies were made among the ranks of upper managers, shaping the personality of the corporation and the path of succession over the last 20 years of its existence. Kirby couldn't be bothered with all the intrigue. His main concern was to isolate the uranium problem so the rest of Westinghouse could get on with its business. So he and the board agreed to split duties: Douglas Danforth, one of the corporation's most experienced senior managers and president of the industrial group, would serve as vice chairman and oversee day-to-day operations. Kirby would devote full attention to the legal battle. The decision would have ramifications later that weren't so apparent when it was made in 1978. Kirby liked Gordon Hurlbert, who ran Westinghouse's power businesses, as a successor. But Kirby couldn't spare his friend. Hurlbert had too many invaluable connections in the close fraternity of utility executives and would be needed to work out deals with them. 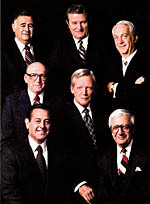 By the time the board was ready to choose a successor to Kirby in 1983, it had grown comfortable with Danforth. Robert Kirby's tenure as CEO of Westinghouse was marked by problems with nuclear power, continued innovation in its technical divisions and the purchase of Teleprompter, one of the nation's largest cable TV systems. Clockwise from top: the newsroom of Satellite News Channel, a joint venture with ABC that competed with Ted Turner's CNN; Gulf Oil, which was fingered in a uranium price-fixing scheme; Three Mile Island, site of the 1979 accident, which was a major contributing factor in the disappearance of the nuclear power plant business. The move to divide duties at the top only formalized what was going on anyway. Almost from the beginning of the uranium crisis, Kirby had become totally engrossed in the intricacies of contract law and uranium mining, leaving the rest of the corporation to his senior managers. And Danforth oversaw the largest and most profitable operating group. Early on in his uranium work, Kirby began casting a suspicious eye across the Golden Triangle to Gulf Oil's art-deco headquarters. Gulf was a uranium supplier and Kirby smelled a rat. His suspicions heightened when, in late 1976, he received copies of documents suggesting Gulf and 28 other suppliers had conspired to form a cartel to keep Westinghouse out of the uranium business. The documents -- minutes from a private meeting of uranium suppliers in Australia -- had come from an unlikely source, the environmental group Friends of the Earth. The people who had staged protests at Westinghouse nuclear plants now wanted to help the evil conglomerate. The group told Kirby it would turn over more documents if Westinghouse helped free members jailed in the Philippines. Kirby balked. He had what he needed. Westinghouse sued Gulf and other members of the alleged cartel. Meanwhile, Westinghouse negotiated with the utilities, and struck settlements with several, including a George Westinghouse cast-off, Duquesne Light. But the bulk pressed on, with the balance of the cases consolidated in a federal court in Virginia. Kirby still bristles when he recalls being deposed by 17 different sets of lawyers. But he was up to the challenge. The son of a Penn State plant pathology professor, Kirby was a quick study, a chemical and process engineer who could solve a Rubik's cube, a popular puzzle of the time, in 72 seconds. Just for a laugh he often would challenge managers and peers to try to solve it. Some never could figure it out, he snickers, declining to name names. Just before World War II, his brilliance had caught the attention of the Navy, which tapped him for intelligence electronics study at Princeton, Harvard, MIT and Bell Laboratories. Even today, friends call him for help with the Sunday New York Times crossword puzzle. After delving into contract law, Kirby thought he had uncovered an out -- a provision that says a contract can be nullified if an outside force that neither party controls disrupts the conditions of contract. And neither Westinghouse nor the utilities controlled uranium prices. But the judge ruled against Westinghouse -- "Thank God," Kirby says now. Had Westinghouse won, it would have had to negotiate not only with the utilities, but also with the state regulators that oversaw them. The political bodies weren't likely to take kindly to being forced to approve new contracts that could raise utility rates. It could have become a quagmire. Instead, the judge ordered both sides to work out an equitable solution. When the dust cleared in late 1979, Kirby had pulled a rabbit out of his hat. On paper, Westinghouse agreed to concessions that would cost almost $1 billion before taxes. But the burden turned out to be nowhere near that severe. For one, the settlements called for Westinghouse to provide parts, engineering and other services to the utilities, at discounts, for up to 25 years, thus locking up the utilities as long-term customers. Even with the discounts, Westinghouse would still make money on the service-and-supply contracts. And the uranium suppliers that had come under suspicion for price-fixing agreed to out-of-court settlements that paid Westinghouse almost $100 million in cash and also provided it with uranium. "As it turned out, the uranium crisis was not the burden everybody thought it would be," Hurlbert says. But the crisis did divert management and financial resources at a time its competitors were expanding. Westinghouse had some catching up to do -- and was about to get smacked again. Just as the uranium lawsuits were ending, there was an accident at Three Mile Island, at a Babcock & Wilcox-designed nuclear plant near Harrisburg. The "event," as nuclear partisans preferred to call it, was preceded a few weeks earlier by release of the "China Syndrome," a movie about a possible nuclear meltdown. Already sluggish, domestic plant orders for nuclear plants dried up. A pioneer in the field, Westinghouse had put a lot of its eggs in the nuclear basket. But early forecasts of future energy consumption would prove high. At the same time, huge discoveries of oil and natural gas reserves and new technology for burning coal would ensure that alternatives to nuclear power remained viable -- and affordable. The cost advantages that nuclear had enjoyed also were evaporating as regulators, prompted by mounting public protests and lawsuits about nuclear plant safety, tightened oversight. Delays and cost overruns became common. Nuclear plants based on Westinghouse designs were being built in four years in France; in the United States, 10 years was becoming the norm. The nuclear business would still be lucrative for Westinghouse. It built or designed more than four of every 10 nuclear plants in operation around the world. All would require fuel and maintenance for years to come, as well as disposal services and, ultimately, decommissioning. Who better to do that than the company that designed the plants? But barring breakthroughs in China or other rapidly developing countries, nuclear wouldn't be a growth business. Kirby needed another rabbit. In 1980, he felt he found one in Teleprompter Corp.
Westinghouse agreed to buy one of the nation's biggest cable television operators that year for $646 million. It was a character-changing event, doubling the size of Westinghouse's broadcasting operations and positioning it as a major player in the booming communications and entertainment industries. It also showed remarkable foresight, achieving in many ways what Westinghouse Chairman Michael Jordan sought to do almost two decades later by going after CBS and major radio and cable stations. Teleprompter would vastly expand Westinghouse's ability to distribute its own programming, an often overlooked piece of a broadcasting subsidiary better known for its TV and radio stations in top markets. Westinghouse programmers had created the Mike Douglas Show; Evening Magazine; the I-Team, an investigative reporting format for TV stations; and the all-news radio format. Teleprompter, which was wrapped into Westinghouse's meager cable TV operations and renamed Group W Cable, wasn't without problems. It had been poorly managed. Many of its aging 12-channel cable systems needed upgrading. And it was notorious for poor quality. One Florida newspaper posed this riddle to readers: "Who are you if, in the last year, you've missed the conclusion of Ronald Reagan's inaugural address, the last inning of the World Series, and the final scene of Gone With the Wind. Answer: You are a subscriber to Group W Cable." Westinghouse would work mightily in the three years following the Teleprompter acquisition to address the ills. It would replace two-thirds of its local cable managers and pump $800 million into expansion and upgrades. Those moves helped, but there were other disappointments. Disney dropped out of a joint venture to produce family films. And Satellite Network News, a 24-hour cable news service done jointly with ABC, didn't generate expected advertising revenues and was dropped. But even when it wasn't making money, Group W Cable provided something Westinghouse needed even more -- cash. It wasn't that Westinghouse's balance sheet was weak or that its debt was too high. It just didn't have a very deep well of reserves when disasters like the uranium lawsuits hit. If it were to confront another big crisis, say a credit unit that goes belly up, it could be forced to sell off divisions and other assets to make up the losses. High cash-flow businesses like cable help protect against that. And Group W Cable was definitely a high cash-flow business, with payments from its nearly 2 million subscribers pouring in month after month. Strong cash flow provides another key benefit: It makes it easier to attract financing. The ability to obtain quick and substantial financing was crucial to Kirby's agenda. He wanted to reshape Westinghouse into a high-growth conglomerate, getting out of stodgy, cyclical manufacturing businesses and expanding into high-margin, recession-resistant businesses. He would need a pot of money at the ready to seize opportunities as they arose. Kirby also brought more financial discipline to strategic planning, naming Don Povejsil (Poo-vay-shul) his chief strategist. Povejsil devised a dispassionate planning tool called "Vabastram," which stood for "value-based strategic management." Through a combination of economic forecasting and statistical formulas, it provided a model for gauging whether a business was worth keeping or buying based on the returns it could be expected to generate for shareholders. Before, strategic planning tended to be more of a seat-of-the-pants affair: Let's buy it and see how it does for a few years. Vabastram was much more analytical. It wouldn't just determine whether a division was or could be profitable. It would determine the amount of investment required to achieve those profits, and then judge whether the same amount of money could generate higher returns if invested elsewhere. If it could, the business was a goner. There would be a lot of goner businesses in the 1980s, when the love affair with Vabastram blossomed. On the management side, Kirby built a team of potential successors. Hurlbert, of course, was out, not so much from Kirby's point of view, but in the eyes of the rest of the board. Danforth was their man; he had a solid record of achievement, was respected by outsiders and was well-rounded. He often would lapse into Spanish at home, a skill honed as a manager in Mexico and Latin America, first for General Electric, and later for Westinghouse. Even without Hurlbert, Kirby's team of future chairmen after Danforth was deep. It included Leo Yochum, the top financial officer; Daniel Ritchie, head of the broadcasting unit; and Edwin V. Clarke, head of the industries group, whose products included electrical controls and motors, light bulbs and refrigerated trucks. Then there was Thomas Murrin, head of the company's most disparate group, public systems. The group's components ranged from defense radar and airport people movers to elevators, housing, land development and the country's largest 7Up-bottling operation. Murrin was a brawny man -- he played tackle for Vince Lombardi at Fordham University -- with a brawling personality. Many considered him to be the golden boy of Kirby's team, the youngest and most successful of the bunch, with a history of fixing problem businesses. Murrin fostered extreme loyalty, and was equally loyal to his workers. But Murrin liked to drink in social settings, rarely stopping at just one Scotch or two. And he was opinionated and brutally honest. These were qualities that didn't go over well with Danforth, a straight-laced sort who didn't much like to be challenged. When he got angry, Danforth wouldn't yell, he'd just turn red. And Murrin had a habit of making Danforth turn red. By the end of 1987, Hurlbert, Yochum, Ritchie, Clarke, Murrin and Povejsil were gone. The cable operation had been sold. And John Marous, whom Kirby liked personally but didn't include on his short list of possible future chairmen, was about to become one.